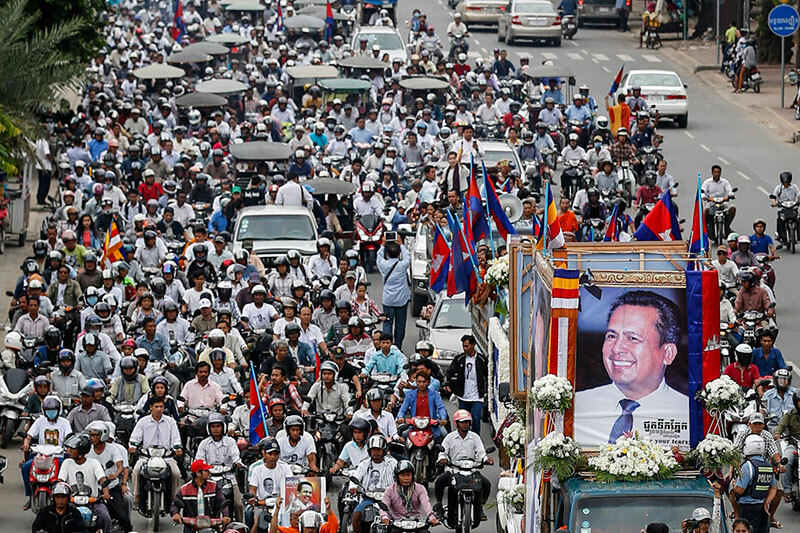 For the second time since Kem Ley’s murder three months ago, mourners on Sunday clogged the main roads leading west out of Phnom Penh on their way to Takeo province, where the political analyst was buried in his mother’s backyard in late July. Instead of following Kem Ley’s flag-draped body out of the city as they did then, Sunday’s mourners trailed behind a life-size copper statue of the man carried on the back of a flatbed truck that left Wat Chas in the early morning. The crowd was also smaller this time. Tens, if not hundreds, of thousands of people had poured onto the streets in late July while the shock of the popular government critic’s fatal shooting, widely believed to be a government hit, was still raw. Sunday’s crowd, though still bitter about a murder investigation that appears to be going nowhere, was down to a few thousand. It was the culmination of a 100-day ceremony for Kem Ley—shot in the head on July 10 while sitting down for his morning coffee at a favorite convenience store and cafe in central Phnom Penh—that drew tens of thousands to Wat Chas over the past three days. It almost didn’t happen. City Hall, accusing organizers of trying to turn the traditional religious event into an anti-government protest, had rejected two requests to hold the ceremony in Phnom Penh before relenting last week. Sao Kosal, who was on the organizing committee for the ceremony, said it was crucial that the event be held in the nation’s capital, and not Takeo, as authorities had urged. Having the ceremony in Phnom Penh allowed for the most people to attend—about 60,000 by Mr. Kosal’s estimate—and remind the government that the masses wanted Kem Ley’s killers brought to justice. The man arrested for the murder within hours of the shooting has confessed to killing Kem Ley over a $3,000 debt he was owed. Police say they believe someone was “behind” the gunman, but have declined to elaborate. Many Cambodians are convinced the attack was ordered by someone high up in the government and want authorities to release video footage of the shooting caught on the convenience store’s cameras, which they refuse to do. Teng Lay, a Phnom Penh housewife who joined the cortege on the city’s outskirts, shared Mr. Kosal’s thoughts on why the ceremony had to be in Phnom Penh. “We wanted to celebrate in Phnom Penh because Phnom Penh is where he was shot dead, and we wanted to remind the government to work hard to investigate his murder,” she said. And like most, she was sure Kem Ley was murdered for speaking truth to power. Mr. Kosal said the funeral procession reached Kem Ley’s grave at about 2:30 in the afternoon. He said the statue would be placed in front of the grave in the next few days, once the concrete pedestal was finished. Phnom Penh authorities rejected a request to place the statue at the city’s Freedom Park or any other public location. As for the investigation and video footage, Interior Ministry spokesman Khieu Sopheak said prosecutors were working on the case and then hung up on Sunday. The government has denied any involvement in the murder, and Prime Minister Hun Sen has sued opposition leader Sam Rainsy for saying it was involved.